If you are looking for a great church fundraiser or christian fundraiser then this is the perfect candle fundraiser for you. 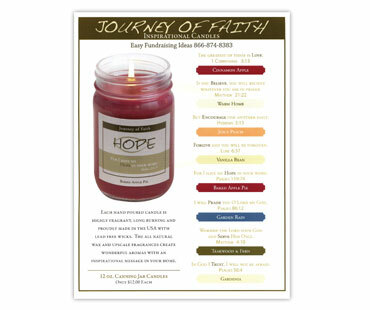 There is no cost to start a Journey of Faith candle fundraiser. We will send you free brochures and order forms. You even get FREE SHIPPING with your candle fundraiser with every order of 151 church fundraising candles or more. The candles sell for $12 each and you will make 50% profit on every candle you sell. That's 50% profit on each fundraising candle. All of our Journey of Faith Candles are produced right here in the United States. We will ship your order approximately one week after receiving your order and payment.